In a post at Law21, Jordan Furlong claims that no one wants to ask whether Mandatory Continuing Legal Education programs work, i.e, that they improve attorney competence. He suggests there is no evidence. There is. But MCLE organizations do need to pay more attention to the evidence. Increased participation in continuing education correlates with increased knowledge. So, what those of us who have been involved in MCLE for decades have always assumed - that attending CLE programs would increase lawyer knowledge levels - turns out to be validated. Who wants to argue some state or province should repeat this study just to show the same in law? Jordan also suggests asking lawyers about MCLE. Again, it's been done. Repeatedly. In multiple states. Over more than a decade. And the results are always the same: overwhelmingly positive responses indicating they approve of MCLE, they think it is making them a better lawyer, and they think it is making others a better lawyer. This data is online: Mandatory CLE Survey Analysis. But, the competence criticism has some validity. I agree with Jordan about the lack of purpose statements for MCLE programs. Basically, the writers of the Rules for the first programs back in the 80s appear to have assumed purpose was self-evident, and later drafters copied. However, after 24 years of leading an MCLE program, I can tell you that, in practice, the purpose evidenced by the behaviors of many state MCLE programs does not appear tightly focused on competence. Many (most?) don't approve the type of training most needed to improve competence. d) designed to support the development of organizational cultures within firms, law departments, and legal agencies that recognize, support, and encourage outstanding professionalism. Dual credit means credit that counts for either the Ethics/Professsionalism or the General requirement - it's the most valuable type of credit for compliance. In addition, Tennessee has now undertaken an experiment in acccrediting mentoring (voluntary) for CLE, and the approach requires substantial training for mentors around the powerful negative impact of law school on the motivation and well-being of law students, the aspects of that impact that continue and are reinforced in practice, and key skills and practices that can re-build, maintain, and enhance levels of commitment, energy and engagement that lead not only to satisfaction in the practice, but also to the highest levels of professionalism and client service. So, MCLE works to build knowledge, but many MCLE jurisdictions should not only accredit programs focused on helping lawyers engage better with their practices, peers anc clients, they should encourage the provision and participation in such programs through explicit approval language and no-limits accreditation. These courses are highly interactive with custom-developed interactivity features not found in other distance learning MCLE courses. Law’s Five Challenges to Thriving: Many law students start to lose their thriving edge in the first few months of law school. This trend continues in practice where the well-being of lawyers is strikingly low compared to other professions. Why? This course pulls from multiple sources of cutting edge research to both explain a unique set of challenges faced by lawyers and give practical steps lawyers can implement immediately to get more of what they want out of life and the practice of law. We’re talking the foundation of professionalism here! Flexible & Accurate Thinking for Lawyers: A foundational skill for a more resilient, thriving oriented approach to practice and life – and one that may be uniquely valuable to lawyers – is flexible and accurate thinking. In many cases, for lawyers this will mean more realistic optimism, but the focus is always on flexibility and accuracy. Apparently, you can be a great law school dean and totally fail at Job 1! Brian Leiter's Law School Reports has a post about ten "transformative" law school deans in the last decade. Wow. Talk about detached from reality. Not one word about Job 1 for a law school: helping law students become successful as lawyers, citizens, community members, leaders, and human beings. And, even more than that, not one word about the absolute disaster law school is personally for a large percentage of law students; that it generates exceptionally high depression, cynicism, out-of-control aggression, hostility, poor sociability, drinking as a coping response and other counter-productive patterns of thinking, feeling, and acting. No, it's all about "intellectual identity" and "scholarly profile." Really. I sometimes wonder how many law professors care what's happening to students in their school. Some clearly don't. Yes, law schools teach law students to "think like lawyers" (a necessary but insufficient part of actually practicing law! )- and that "think like a lawyer" training is devastating to many of those students. Come on deans, focus! We desparately need lawyers who are in touch with their values, engaged, collaborative, able to find emotionally intelligent pathways forward in situations beset by the unique challenges to thriving present in many legal matters. and . Not to mention who can help create legal and regulatory approaches that work better for society. You're really not doing a very good job of that (and that includes you, Tier 1!). So how about a little evidence you have some clue what is important? If nothing else, you could at least contact Larry Krieger and Ken Sheldon and make sure your school is getting accurate data on what's happening with your students. Or would you rather not know? Want to know more about Law's Five Challenges to Thriving? If you would like CLE credit for learning about the Five Challenges and you are in Illinois, New York, Tennessee, Texas, or Rhode Island, our special offer continues - $49 for 3+ hours in two courses! Todd Kashdan, the preeminent researcher on curiosity, has written a great column on "Can Curiosity Be Learned?" Since curiosity is one of only three character strengths that lawyers seem to endorse more strongly than the average American, it may be a great pathway for lawyers to use to re-connect with values, purpose, and, ultimately, meaning in life. (Start discovering your strengths here.) Those are steps along one path to greater well-being. Todd also includes the best couple of paragraphs I have seen on cultivating mindfulness through either formal disciplines (meditation, yoga) or in the course of daily living. The body empirical evidence of the benefits of mindfulness is strong and Todd's suggestions point to ways to get started. Photo: "Bunch of Fun" by makelessnoise. This ABA CLE appeals to my geekier side! I am grateful for opportunities to apply positive psychology! What CLE is most important? Recently, I have asked the following question of a number of attorneys in CLE programs and at a meeting of MCLE regulators from around the country. Each time, I've gotten similar responses. 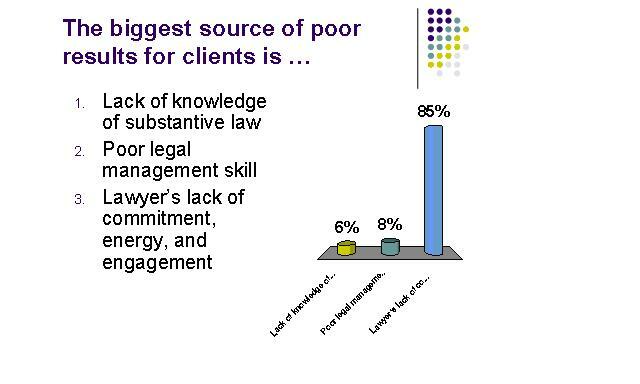 Overwhelmingly, lawyers, and those who regulate CLE, recognize that it is NOT lack of substantive knowledge and it is NOT poor legal management skills that most often cause poor results for clients. 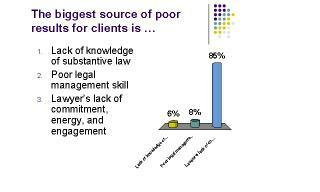 Rather, poor results most frequently result when a lawyer's commitment, energy, and engagement are too low. Positive psychology offers some avenues to address this situation. Positive emotions, according to Barbara Fredrickson's research, broaden our thought/action repretoire and help us build social and psychological capitol for the future. Happiness, as measured by the Authentic Happiness Index (check yours at www.authentichappiness.org) includes engagement and meaning. Engaged individuals who experience flow in their day-to-day activities have energy. Individuals who feel connected to something bigger and greater than themselves have commitment to carry through. We need CLE that focuses on helping lawyers develop commitment, energy, and engagement. And we need to accredit such CLE. Unfortunately, most MCLE regulators indicate that such programs would have difficulty getting accredited in their states. That needs to change. A Google News Alert I have set for MCLE matters brought this Law.com article to my attention. The article deals with what law firms can learn from the struggles of accounting firms to maintain ethical awareness and action as the controlling metaphor and structure of the firm moves from a group of individual partners to an integrated enterprise. The author notes the long-observed effect where indivduals with personally high ethical standards can learn to behave in ways that transgress those standards within a group context. Thus, the “ethical standard” of a firm may be significantly less than the personal ethical standards of the members of the enterprise. A. Continue to deny all in-house CLE. B. Allow all in-house CLE. C. Allow in-house CLE clearly tailored to the unique needs and demands of firms if it meets more stringent standards of development, presentation, and evaluation. I am not arguing one way or another on this. But I do think that in this matter, as in some other areas, it is appropriate and responsible for decision makers to revisit from time-to-time long-past decisions to see if they still seem to be the most appropriate compromises in light of the current structure, role, and public standing of the profession. Last Tuesday, the 10th, I participated in a CLE program that was the exception to the rule that "war stories" are not good CLE. "War stories" are anecdotes about a trial or other experience in representing a client. Often, these stories, while entertaining, primarily serve to make the storyteller look good. They lack educational value. This program, "To Do Justice", was different. It was put together by Douglas Bates, III, a Centerville, TN, lawyer whose father, Douglas Bates, II, was defense counsel for the 40 defendants in the first American war crimes trial of Nazis after World War II. Joshua Greene, author of the book shown at the right, and producer of the acclaimed "Voices from the Holocaust" documentary, contacted Doug Bates on 9/11/2001 to ask him about his dad. Professor Greene had just finished reading the transcript of the first Dachau trial at the invitation of the widow of the prosecuting attorney, Bill Denson, and wanted to know what Doug knew of his father's role in that trial. 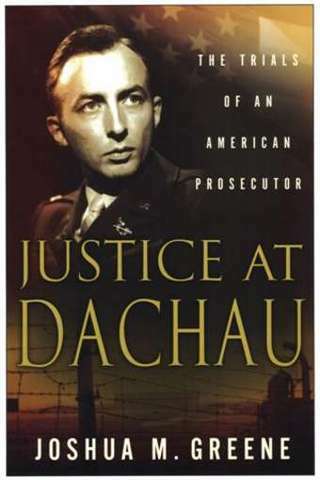 Greene and Bates became friends, and Doug Bates conceived the idea of bringing Joshua Greene to Nashville for a CLE program built around the Dachau trial. Monday evening (the 9th) and Tuesday saw the fruition of that dream. I was contacted several weeks ago about consulting on a contract through the National Center for State Courts with the Louisiana State Bar Association. It was to entail five days or so on-site, hopefully in August, but there was a re-work of the team that delayed the contract. I think it's finished now, but since the bar center is right in downtown New Orleans, we obviously won't be down there anytime soon. My counterpart in Louisiana sent got an e-mail out that she had safely evacuated to Houston. That's good news, but it's hard to grasp the pictures I'm seeing of the devastation to that beautiful city. Here's hoping they can get the water out soon and that recovery won't be as difficult as it now appears. They're saying two months before schools can re-open! And thanks to all the disaster workers headed that way. The beautiful and patient Teresa asked me if, when Patrick's off to college, if I'd join her in volunteering for a disaster recovery team. She's always wanted to do that. Absolutely. With her people skills, organizational ability, and level headedness, she'd be great, and I'd certainly do whatever I could.